Employ Wainscoting and Trim. There's no way around it. Wainscoting, crown moldings and other types of custom trimwork make a home look elegant. Fortunately, they're not terribly expensive to install, especially if you have the tools and know-how to do it yourself. Paint Doors. Set the aesthetic from the moment a guest arrives at your house. Paint your front door a color that complements your home’s interior. The door's color will anchor your home's color scheme while adding drama and style to your entryway. Also consider painting the interior doors in your abode a signature color that makes your residence one-of-a-kind. Opt for Luxury Vinyl Plank Flooring. Love the look of hardwood, but can't afford the price tag? Luxury vinyl plank flooring is an affordable alternative. The best part? You can probably install it yourself, which means you don't have to pay labor costs. Vinyl plank flooring can be glued or clicked in place for easy installation. It's also waterproof, which makes it a practical alternative in kitchens and bathrooms. Copy a Look You Love. During your window shopping trips, you've probably discovered furniture, light fixtures or other design elements that are way out of your price range. That's fine! Snap a photo so you can recreate the look for less. A quick search on Pinterest may reveal similar ideas. Or hit the thrift stores and flea markets to find raw materials for your design hack. Fake It 'til You Make It. Expensive homes often have soaring ceilings. Your home's ceilings may be decidedly lower, but you can make them look higher. Just hang your curtains closer to the ceiling than the window frame. This creates an optical illusion that makes the room seem taller. Embrace Your Artistic Side. Large-scale artwork is a great way to set your home apart, but it's usually quite pricey. Instead of blowing your budget, make it yourself. Simply buy a huge, white canvas and create a masterpiece. Abstract paintings are good options if you're not artistically gifted; if you have a little talent in this area, you might try your hand at a more contemporary composition. Display your art prominently in your home. When friends ask about it, just tell them you had the piece commissioned by an up-and-coming artist! Don't Overdo It. Adding too many elements to a room will cheapen the look. If a room appears too cluttered, remove some knick-knacks, pillows or books. Remember, less is usually more when it comes to interior design. 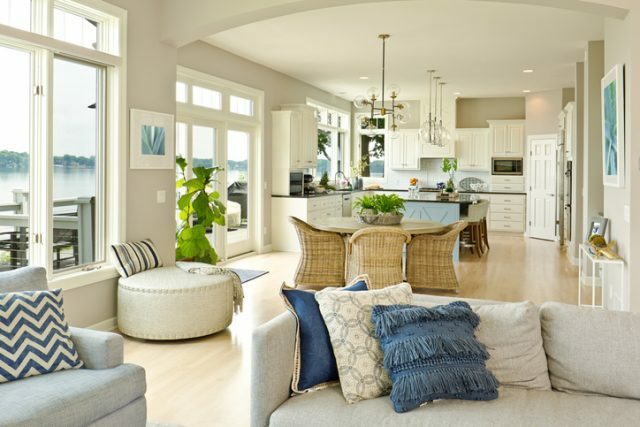 You'll end up with a more sophisticated space that feels light and airy instead of cramped and busy. Camouflage the Television. While the television may play a prominent role in your family's life, it can also detract from your interior design. Hide it in a cabinet, piece of furniture or behind a screen when you have visitors. Making your home look like a million bucks doesn't have to cost a fortune. You can achieve a high-end look for less using some creativity and these tips.